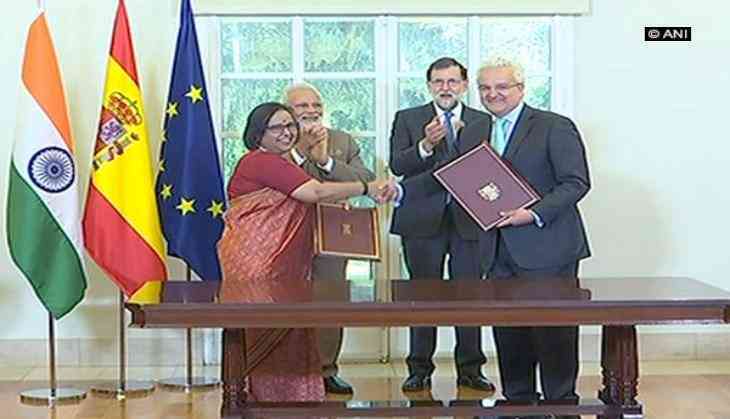 India and Spain on 31 may signed seven agreements across multiple sectors following delegation-level talks, co-chaired by Prime Minister Narendra Modi and his Spanish counterpart Mariano Rajoy in Madrid. Giving fresh impetus to multifarious relations between Spain and India, PM Modi and Rajoy witness exchange of seven MOUs across various fields. Prime Minister Modi said cooperation in railways expansion and upgradation, smart cities, infrastructure, etc are areas of India's priorities and requirements where Spain has enough skills and mastery in such fields. Describing terrorism as a global threat, Modi said "Both our countries have faced terrorism and strengthening cooperation on this security challenge is an important part for bilateral agenda. Terrorism is a challenge for all of our societies, we get to hear a lot about terror attacks these days." Prime Minister Modi is on a two-day state visit to Spain. He arrived in Madrid on 30 may amid his four-nation tour.